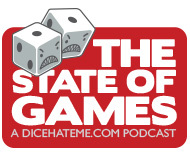 Dice Hate Me Games and Unpub want YOU… to design a game! The challenge? Create a fun, engaging game using only 54 cards and then put it in front of a bunch of strangers to see how you fared! Interested? Here are the details! All contest submissions are due by the end of day Jan. 2, 2014. Please submit rules in PDF to chris@dicehateme.com before the due date (I suggest by Dec. 24, 2013) and request the DHMG HQ address to send physical prototypes. Prototypes can be in any playable form – anything from simple paper cutouts, stickered standard decks of cards, sleeved cards or even decks created using print-on-demand services. These do not have to be fancy – no points will be awarded for slick graphic design. Only one entry per person is allowed. Send us your best! All submitted game entries will be evaluated and judged by a group of local Durham, NC playtesters before Unpub 4 (www.unpub.net) in Dover, Delware on Jan. 18, 2014. The top six games will be played and judged at Unpub 4 by a group of playtesters to be determined. The game submission that garners the highest voting score will receive a publication contract with Dice Hate Me Games, to be included as part of a special Kickstarter campaign in Spring 2014 with two other 54-card games. These games will be produced domestically, and will be limited to 500 units. This will officially introduce the “Rabbit” line of Dice Hate Me Games, and the designer(s) of the best-received game of this group of three will have the option of a further publishing contract with Dice Hate Me Games for a larger print run later in 2014. Any further questions should be directed to chris@dicehateme.com. Now get out there and create something awesome! awesome! can’t wait to hear more about the rabbit line! We’ve already revised and updated the card game Mao. Maybe this will strike your fancy for this competition. Hi – is this open to international folk (specifically, UK) and ultimately, who owns the game? Chris – The contest is open to international entrants. If your design is chosen and a contract is signed by DHMG, the game will be under license by us. Otherwise, all other entries remain the property of the designer.